Water from the 9-mile long power canal falls through these two penstocks to the powerhouse turbines. This ogee dam structure diverts flow to the 9-mile long power canal. GeoEngineers recommended and oversaw the installation of a liner along the canal to mitigate seepage through the soil. The earthen hydroelectric canal was originally constructed in the late 1920s. GeoEngineers designed and observed construction of a reinforced embankment for a piping repair in 2012. Ongoing safety improvements to lower risks and keep this hydroelectric facility FERC compliant. 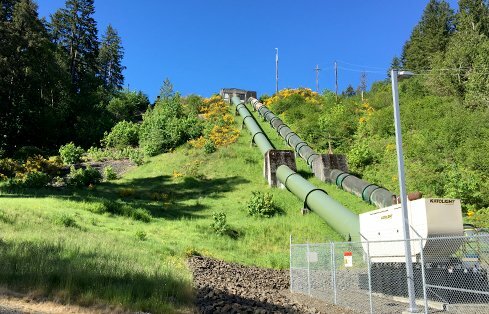 The Yelm Hydroelectric Project provides reliable clean energy to the City of Centralia, Washington. 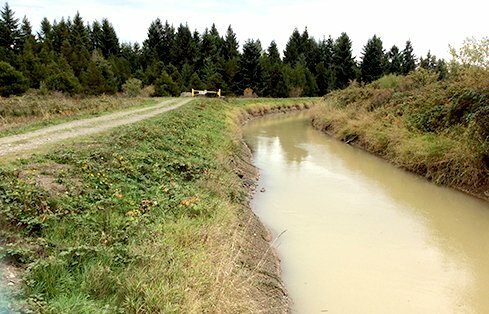 A run-of-the-river concrete ogee dam diverts water from the Nisqually River into a nine-mile canal before it falls 200 feet into the powerhouse. Since that time, GeoEngineers has guided the city through the Federal Energy Regulatory Commission (FERC) regulatory process and helped the facility maintain their licensure requirements. GeoEngineers’ geotechnical, geologic and hydrological experts have completed ongoing evaluation of project safety and provided recommendations for improvements to infrastructure, instrumentation and monitoring. In order to define inundation areas and potential threats to public safety GeoEngineers also completed one- and two-dimensional breach analyses. GeoEngineers designed and oversaw the installation of 1200 feet of liner along the canal for mitigation of seepage and piping. The design details were negotiated with FERC to satisfy their concerns. Installation of new weirs and piezometers to improve the monitoring of seepage and embankment stability and implementation of a seepage monitoring program. In 2012, piping through a steep fill embankment section resulted in a sinkhole, temporarily shutting down the facility. 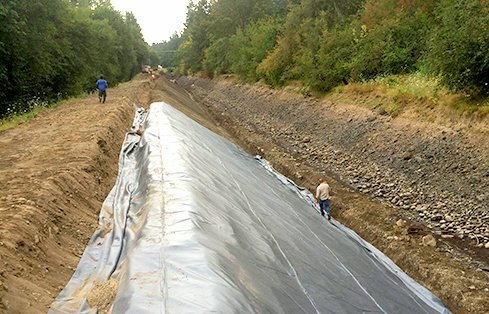 GeoEngineers responded quickly with a plan to repair the embankment with a geotextile reinforced section and coordinated with the City and FERC to bring the project rapidly back online. GeoEngineers has completed three of the four Part 12D Independent Consultant Safety Inspections, developed and maintained the Supporting Technical Information Document, and has prepared all of the annual Dam Safety Surveillance and Monitoring Reports for the project. Our team of hydrologists have completed inundation studies where residential developments are situated downstream of the canal embankment. 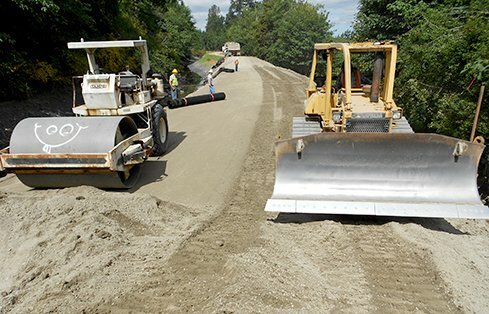 During the long and successful relationship with the City of Centralia, GeoEngineers has performed regular safety evaluations and recommended a progression of improvements to address potential areas of concern. 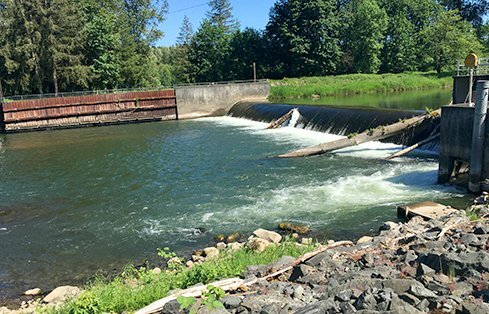 Dam safety is an ongoing challenge that is never complete, but GeoEngineers’ team can equip dam owners like the City of Centralia with the information they need to spend their resources effectively and make risk-informed decisions for improvements to project safety.